Best CloudFlare Review (Apr 2019) | Is Their CDN Solution Overrated? Are you after a free global CDN, DNS, DDoS protection and web security provider that can speed up and protect any site online. CloudFlare operates a highly-available global content delivery network that has security measures built into every layer and regularly clocks in lightning-fast speeds. The concept of combining web security and performance enhancing into a CDN is relatively new and there aren’t many products that offer both of these features. CloudFlare speeds up your website and protects it from security threats. According to CloudFlare, on average a website using CloudFlare loads twice as fast, uses 60% less bandwidth, has 65% fewer requests and is more secure. CloudFlare’s cheapest CDN plan is 0.00 per month (i.e. free!). CloudFlare has so far made more than 2 million websites across the globe faster and safer. Join today. CloudFlare was founded by Matthew Prince, Michelle Zatlyn and Lee Holloway in 2009. Although CloudFlare started as a project designed to stop spammers from harvesting email addresses on websites, in 2009, the company’s focus shifted towards providing web security solutions. With time, CloudFlare founders realized that security software was one of the factors behind slow site performance. This prompted the development team to find ways of improving site performance while at the same time offering solid Internet protection. This is how the Content Delivery Network, site caching, and web security service that we now know as CloudFlare was born. Founded by Matthew Prince, Michelle Zatlyn and Lee Holloway in 2009. What is Cloudflare Used For? CloudFlare provides a suite of products for optimizing website speed and security. This review is focused on their CDN — or content delivery network (CDN) — designed to optimize site loading times by acting as an intermediary between site servers and visitors. The CDN also offers security benefits. Copies of your site are cached in datacenters spanning the globe. Your site is served to visitors from the geographic location closest to them. At the time of writing, the company reports of operating over 150 data centers around the world. CloudFlare uses a proprietary technology known as Anycast to route your visitors to the nearest datacenter from their current location. This, in turn, causes your cached website to open twice as fast the average load time. As an added bonus, CloudFlare optimizes site speed for visitors on an IPv6 network even if your server environment is still on the old IPv4 infrastructure. This graphic illustrates how site loading time is affected by use of a CDN. Image courtesy of Cloudflare. Try CloudFlare. Get your website supercharged in less than 5 min. Sign up now. Besides providing CDN optimization and site caching services, CloudFlare also blocks threats that might compromise your website or waste bandwidth and other server resources. The software offers a host of security features that protect websites against security threats such as SQL injections, spamming, and DDoS attacks. 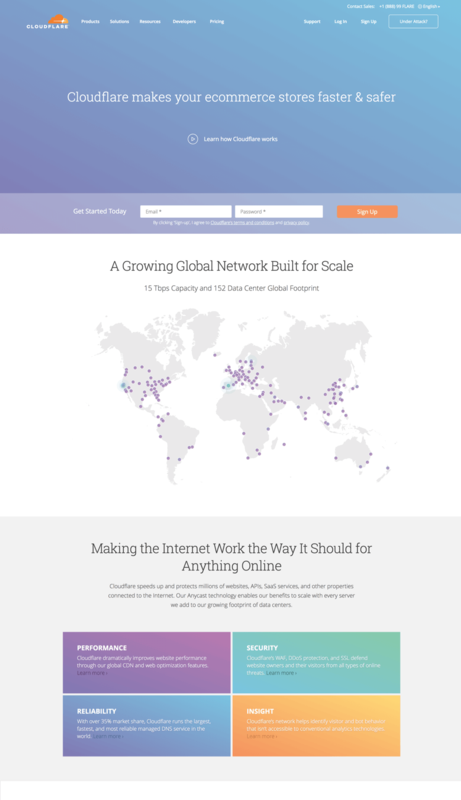 Cloudflare’s network spans 152 cities, including 22 locations in mainland China. When it comes to pricing, users will be happy to know that CloudFlare offers both a free version and several paid plans. The free plan offers full access to the global CDN, a broad range of security features, SSL encryption and powerful statistic reports about site traffic. However, it has a few caveats such as weekly site crawls, as well as an activation period and analytics updates that take effect after 24-hours. On the other hand, CloudFlare’s paid plans, namely Pro, Business, and Enterprise, feature better site protection, more frequent site crawling, mobile optimization, and DDoS protection. So while the free plan offers basic protection, but CloudFlare recommends its entry-level paid plan for professional websites. How Easy is it to Set Up and Use Cloudflare? CloudFlare is very easy to set up as long as you have a self-hosted website. Enabling the service on your website simply involves making a few changes to your domain’s DNS settings, a process that takes less than 5 minutes. CloudFlare’s Wizard set-up takes care of everything step-by-step. So, there’s no need to change your site’s existing code or make any hardware and software installations. Video above: This demo shows that set up is simple. Courtesy of Cloudflare. You’ll receive the CloudFlare nameservers for your domain. Your account is all set and the nameserver update will take about 72 hours. Your site won’t experience any downtime during this period. After setting up CloudFlare, you can start to monitor traffic statistics for your website. Analytics data is usually updated every 24 hours on the free plan and at 15-minute intervals if you choose to go with one of the paid versions. CloudFlare offers an intuitive interface that can also be customized if you’re on the premium plans. When it comes to protecting your website and visitors, CloudFlare offers quite a few security features. For starters, the Reputation Threat module blocks malicious threats by identifying IP addresses. CloudFlare also offers the ability to block IP addresses by range or country. This helps to keep already known threats at bay. You don’t have to worry about bots crawling your website and harvesting email addresses because CloudFlare provides protection against content scraping. Other standard security features include SSL encryption, HTTP/2 as well as protection against DDoS attacks, SQL injections, cross-site scripting, and comment spamming. Higher tier plans provide advanced security features. For instance, if you’re on Pro the plan and above, your site will benefit from a Web Application Firewall and OWASP ModSecurity Core rule set. In addition, Business and Enterprise plans receive advanced layer 3, 4 and 7 DDoS protection. A DDos attack aims to make a website or online service unavailable by flooding it with traffic. Such attacks usually take place against a targetted website from a network of computers known as a botnet. A business targetted by a DDoS attack stands to lose huge sums of revenue during the time their website is unavailable. A botnet is a network of computers used to carry out a DDoS (Distributed Denial of Service) attack. BotNet computers are often used without their owners’ knowledge or permission. They are often recruited following the installation of malware on the machine. The Heartbleed bug is a vulnerability first discovered in 2014. It affects the Open SSL cryptographic software library and allows for the theft of information protected, under normal conditions, by the SSL/TLS encryption used online. After finding out about the bug, which had been on the internet for two years, Cloudfare started an investigation to see whether their private keys and those of their customers were at risk. They also started the Heartbleed challenge – a crowdsourced test designed to see if the company’s private keys could be hacked. They found that within two hours a dedicated attacker could retrieve a private key from a vulnerable server. As a result, they then reissued all Cloudfare SSL certificates in a bid to patch the problem. HTTPS is a secure and encrypted version of the regular HTTP protocol. Under a regular HTTP connection information is sent in the clear from your computer across the internet. However, this information is encrypted when HTTPS is used, meaning that it cannot be viewed by external parties. It is a combination of HTTP with SSL. SSL (Secure Sockets Layer) is secure a secure protocol that works on the top of HTTP to enable data security. In practice, SSL encrypted data is routed using protocols like HTTP for communication. Two-factor authentication is an extra layer of security which requires a user to have an extra piece of information along with their password. This often takes the form of a physical token or a message sent to a physical device such as a mobile phone. It is particularly useful for small businesses that are worried about data security online. It means that even if your company’s password is hacked, crooks will be unable to access your data without additional authentication. What Kind of Help and Support Does Cloudflare Offer? If you ever need to contact customer service for technical assistance, CloudFlare offers both phone and email support. However, chances are that you won’t have to contact the support team thanks to CloudFlare’s comprehensive help center. The help center comes replete with video tutorials, troubleshooting guides, and searchable knowledge base articles that provide answers to frequently asked questions. If you want updated information about the product and company, you can also visit CloudFlare’s Community section to read blog posts and developer news. What are the CloudFlare Pros and Cons? CloudFlare has a great free offering, but there are a few drawbacks. In addition to optimizing site speed, CloudFlare also offers security features to protect your website from threats. The pre-loader can pre-cache your most popular pages to make load times much faster. CloudFlare notifies you if Google Analytics is not working properly. The software tracks site traffic and generates analytics data to help you know how well your site and CloudFlare are doing. The setup process and user interface are both intuitive. CloudFlare’s Always Online feature and CDN continues to serve a cached version of your website even if the main server goes down. There is a free version that lets you test CloudFlare’s basic features. Advanced security features are only available on the paid plans. The free version takes 24-hours to propagate and update analytics data. In addition, CloudFlare will only crawl your site update cached versions once a week if you are on the free plan. Stats and analytics are limited but still better than nothing. On the plus side, you can integrate Google analytics with CloudFlare to provide more detailed statistics reports. The concept of combining web security and performance enhancing into a CDN is relatively new and there aren’t many products that offer both of these features. CloudFlare speeds up your website and protects it from security threats. While it may have a few cons as described above, this service is still a great option and even a cheaper than MaxCDN. Overall, CloudFlare is worth trying if you need to optimize page load times on a content delivery network that does not comprise your website’s security or cost you a fortune. This is a concise overview of the plan differences. There are additional features available for the Enterprise plan. Contact Cloudflare for more information. Here are some common questions about Cloudflare, answered. Does Cloudflare provide shared hosting and WordPress hosting? Cloudflare is not a hosting provider, but it easily integrates with several major hosting providers such as SiteGround and Bluehost. You can add enable Cloudflare from your website from the Cloudflare control panel. WordPress integration is as simple as installing the Cloudflare plugin. It’s a one-click installation process. Cloudflare’s free plan offers basic protection from attacks like DDoS, and a shared SSL certificate. It may be adequate for many small business websites. They do recommend their entry-level paid plan for professional websites. You’ll get all the free features, plus add-ons including a Firewall. Where are Cloudflare’s datacenters located? Cloudflare has datacenters across the world, located in Africa, Asia, Europe, North America and the Middle East. They have a presence on almost every continent. You can monitor the system status from their website. A log on the site also reports any incidents. How will Cloudflare impact my SEO? There’s been an ongoing debate on whether a CDN like Cloudflare can hurt your SEO. Cloudflare has denied this claim, adding that their own findings support their claim that CDNs help improve performance and SEO. They also include a Tweet from a Google Trends Analyst, John Mueller, that states CDN’s can help websites rank well – if they’re configured correctly. CloudFlare uses a different pricing structure compared to other CDN’s. CloudFlare doesn’t charge you for using its CDN, while other CDN’s pricing plans are based on how much bandwidth your website uses. CloudFlare offers four plan types; free, pro, business, and enterprise. For more information and latest and most up to date prices visit CloudFlare’s website. We monitor tweets about CloudFlare and apply sentiment analysis to classify tweets as positive or negative. This allows us to output an approval rating score, which is based on real people, positive and negative, opinions about CloudFlare on Twitter. CloudFlare approval rating score is 77%. This is based on a total of 26 tweets that mention CloudFlare on Twitter. There are 20 mentions that share a positive sentiment and 6 mentions that express a negative sentiment. Find out more about how it works. Great work by Google's @elie and @Cloudflare's @grittygrease on the prevalence of HTTPS interception. Look what's getting fixed just in time for a busy week at @Cloudflare! @eastdakota will be so happy!! Try CloudFlare. Supercharge your website in less than 5 minutes. Signup now! You are here: Home > Content Delivery Network Reviews: You Need A CDN. We’ll Show You Which One Is Best For You. > CloudFlare CDN Review: It is Free, But Is There A Catch? Previous: CDN77 Review: A Feature-Heavy CDN, But Do They Compromise On Speed? Next: CloudFront CDN Review: Pocket Friendly CDN. But wait, There’s a Catch!